Labels for mailing / shipping can be printed from the customer screen. Select Customers from the menu bar to get to the customer window. 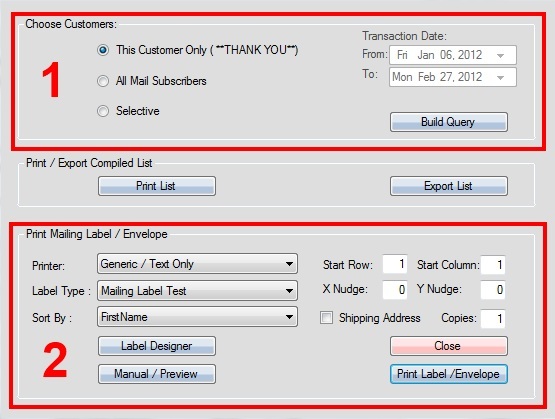 If you are printing a label for just one customer, select the customer from the list, otherwise you can leave it with the default customer. Press the More button. A menu will popup at the button location, select Print / Export from the list of options. 2. Select options for printing. Select your printer, label type, and the order in which they will be printed. Use the Label Designer button to create a new label. Check the Shipping Address box if you are printing labels for your customers’ shipping addresses, rather than home addresses (if different). Press Print Lable / Envelope to print.